It’s the start of the summer after graduation and Elizabeth (EB to her friends) can’t wait to leave her miserable mum with her desperate love life and head all the way across to the other side of America to start college in San Francisco, where her gay dad now lives. When the university emails her contact details of her college room-mate, Lauren, so they can sort out what they’re each bringing, EB emails her. Lauren’s feeling about starting college just across the bay and escaping her chaotic home life with her mum and dad and five younger siblings are more ambivalent. She’s going to miss them so much, but she relishes the thought of finally having some peace, so she is very disappointed to discover that her request for a room of her own is refused. As the correspondence builds that last summer, both girls find themselves telling each other their hopes and worries, and confiding details of their new romances that they don’t even reveal to their friends. But when Lauren meets EB’s dad and tells EB things she doesn’t want to hear, their relationship fractures before they’ve even met. Can you just have too much truth? This novel is a great read, capturing all the conflicting emotions that come with leaving home, no matter how much you think you want to go. 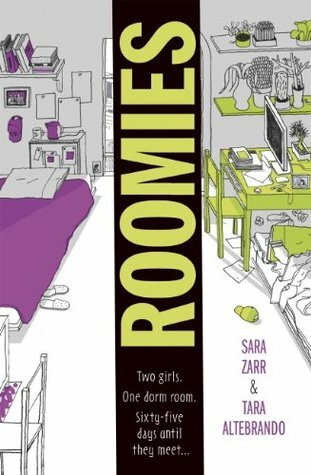 Written by two authors from each girl’s totally unique perspective, the reader really enters each girl’s totally different world. It captures the excitement and fear, not just of heading off to college, but also growing up and accepting and adjusting to relationships both within and outside the family. My one criticism would be that the voices of the two girls aren’t quite distinctive enough, and some of the other characters, particularly EB’s mum could be more developed, but I very much enjoyed it all the same and really felt I was there with the girls as they say goodbye to everything they know and love, and face up to such a momentous change in their lives. I was desperate for something to read last night and I wasn't at home so I started this on my phone. I like it a lot so far.